Osborne Wins 3rd Main of the Year! Dylan Ferrandis First Podium on US Soil! Clement Desalle podiums in Bulgaria! ROCKSTAR SPRING BREAK HAS BEGUN! Rockstar Athletes medal at X Games Tignes! Win Head to Toe Rockstar Gear! Win! A Sammy Carlson Prize Pack! JCR/Honda Race report: 2014 GNCC round 2, Washington, Georgia: "The General"! TANNER FOUST TAKES OVER ROCKSTAR TWITTER! Clement Desalle Leads Belgium to MXoN Victory! The Wakeskate Tour | Battle Falls Live Now! 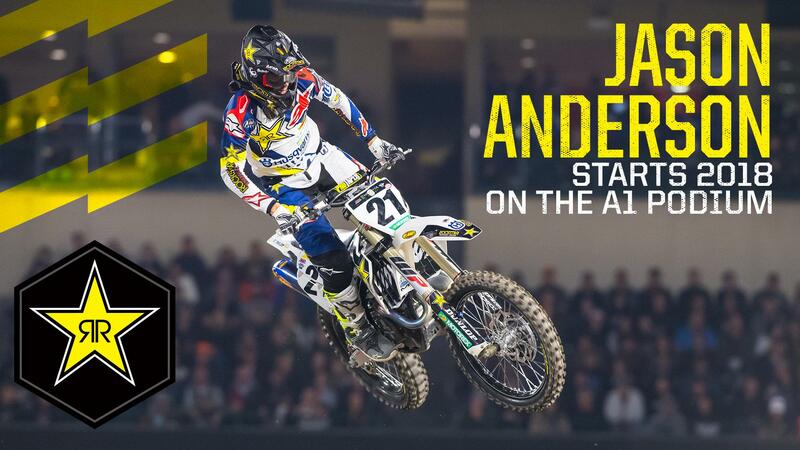 Good Luck at X Games Los Angeles! The Wakeskate Tour | Suwannee Pro LIVE NOW! Jessica Patterson wins 7th career WMX Championship! Congrats to Amber Wing, Dean Smith and Tony Lacconi! "New Hights" Episode 4 LIVE NOW! Dylan Ferrandis Wins Two Titles in the French Elite MX Championship! Jeremy Seewer Podiums in France! Clement Desalle Podiums in France! Hands Like Houses Announce New Record! Good luck at X Games - Barcelona!